In GREAT AT WORK, Professor Morten Hansen reveals the results of his extensive research study, which began in 2011, and examined the activity of 5,000 workers. The author was trying to figure out exactly which factors contributed to one being an especially superior worker. The researchers whittled down the factors to just seven "Smart Practices." These seven factors, as a whole explained about 2/3 of what makes someone really effective. The biggest factor leading to superior performance is called "Do Less, then Obsess." Great performers figure out what to NOT do. This means "Shaving away unnecessary tasks" like meetings, procedures, and useless metrics. Perhaps my favorite section is the large chapter on the "Learning Loop." Here's the key: Spend a little time each day improving your skills. To not be overwhelmed, just "pick one and only one skill at a time to develop it." The author mentions the "10,000 hour" rule (popularized in Outliers by Malcolm Gladwell), but cautions the reader that it's not just practice of any time--it must be deliberative, focused practice. Along with the research findings, the book includes lots of anecdotes of people who (mostly) exemplified the desired traits--but not all the stories are good ones. There is one especially sad account of one man who wanted to live his dream, but ended up losing all his money. 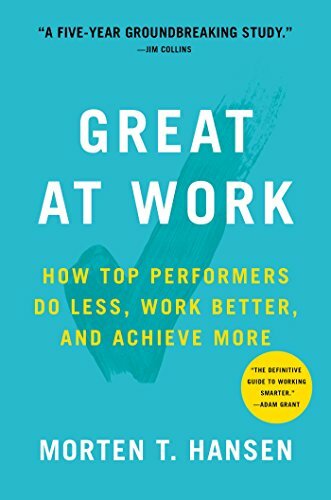 So all in all, I found GREAT AT WORK to be a valuable book, with lots of practical findings. I was especially interested to find that the current management fad of "collaboration" tends to reduce the effectiveness of superior employees. The author does something really smart in this book--he includes the key points at the end of each chapter. This makes it really easy for the reader to review the main points. Professor Hansen labels the dumb idea the "Work Harder Convention," and his good ideas the "Work Smarter Perspective."